Amazing strand of graduated muritanian shells. graduated from 25mm per bicone pair down to 10mm. Item #10765. One strand available. 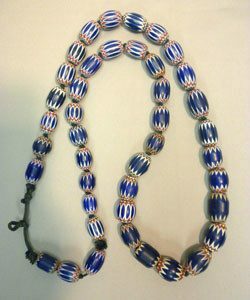 Italian made trade beads. 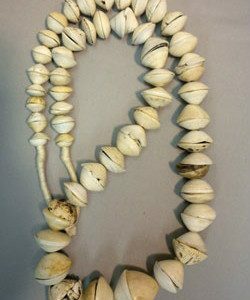 These beads were very popular with American Indian tribes in North America. The more layers seen per bead, the more value placed upon them. Each of the beads has 6 layers of glass per bead. One strand available.